Although the temperature has dropped, winter is no excuse to leave friends and family out in the cold. Summer’s pool parties, garden teas and sunny-weather braais may be last season’s news, but this season brings with it a new kind of social style. Think of sipping red wine alongside a welcoming fireplace, enjoying a hot curry with friends around a friendly dining table or relaxing with family in the comfort of your lounge while challenging each other to a game of 30 Seconds or charades. In fact, despite the cold weather, winter adds a degree of intimacy to home entertaining that warms the heart like no other season. Here is our advice on how to entertain winter in style. 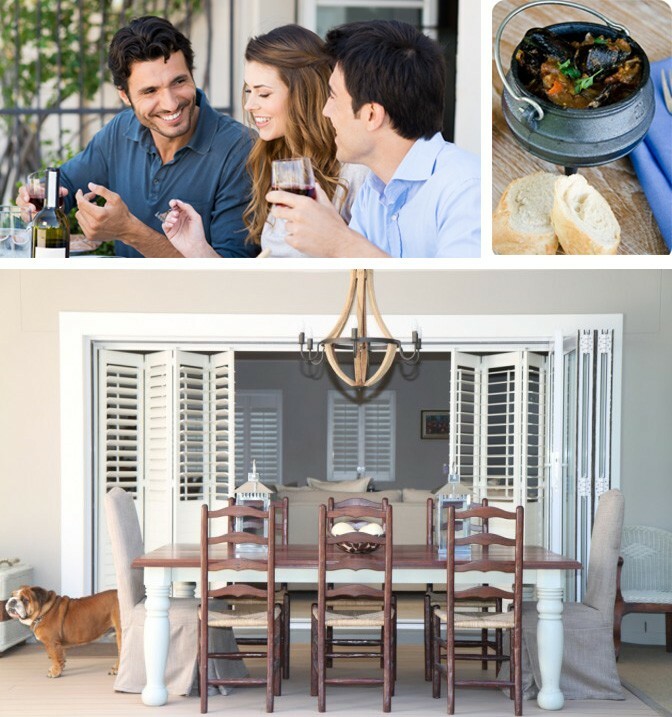 Winter entertaining does not need to be about hiding out indoors; in South Africa we are still lucky enough to have some lazy mild sunny days in winter; days pleasant enough to sit outdoors and savour the company of friends and family, and the taste of a lunch time potjie perhaps. Determining how winter-friendly your outdoor entertainment space depends on how it is designed and decorated. The most obvious consideration is shelter and protection from the cold weather. Outdoor security shutters are perfect for creating a versatile outdoor space that can be enjoyed all year round. When the sun shines the shutter louvres can be opened or the shutter panels completely retracted to expose a balcony or patio for full enjoyment of the sun’s warmth and light. After the sun sets or when winter weather threatens, close the louvres and shutter panels to keep out the cold wind and rain. Homely touches like warm lighting, knitted throws and blankets, a roaring fire and some comfortable furniture that makes it easy to snuggle up on, all help to make the space engaging and functional. Alternatively if you prefer staying indoors, use shutters to direct the winter sunlight inside to warm the space or to shut out the cold when the sun is hiding or is retired for the night. Shutters are great thermal insulators and help keep warm air inside and cold air outside. After all, what beats watching a game of rugby with friends on a cold winter day or evening from the warm comfort of your home, as long as the biltong, chips and snacks are within arms reach, and the Springboks are winning!